The left-leaning think tank which has the ear of the Democratic Party in Connecticut hosted a forum at the Capitol Building today to decry the state spending cap, volatility cap and bonding cap, saying the restrictions will make Connecticut’s budget situation worse. CT Voices for Children held their 18th annual state budget forum on Thursday, claiming Connecticut is not a high-tax state and the government needs the ability to spend more on state services, particularly during economic downturns. Presenters argued Connecticut should be able to exceed spending and bonding caps to avoid reductions in state spending in other areas due to Connecticut’s growing fixed costs and offered ideas of ways to repeal or adjust the caps. The forum may provide insight into how a new, largely progressive legislature may plan on confronting the state’s fiscal issues. “We are unaware of any other state in the country that has delegated its constitutional taxing and spending authority to Wall Street investors as we have now done here in Connecticut,” Mills told forum. The spending cap was passed in 1992 by an overwhelming majority of Connecticut voters. The cap was passed in conjunction with the state income tax and was pitched to voters as a way to ensure state fiscal responsibility. The cap was not actually implemented for 25 years. The bonding and volatility caps were put in place as part of the 2017 bipartisan budget agreement. The bonding cap came after bonding spiked during Gov. Dannel Malloy’s administration and limits state bonding to $1.9 billion per year, although that limit increases based on inflation. The legislature in 2018 passed a law allowing Connecticut to exceed the cap for purposes of refinancing old debt and bonding for transportation spending. But the bonding cap also faces pressure from Connecticut’s bailout of its capital city, Hartford, which will total $534 million over the next 20 plus years. The volatility cap places revenue which comes in over projections into the states Rainy Day Fund. The volatility cap has already pushed Connecticut’s reserve budget to nearly $2 billion. Rachel Silberman, Fiscal Policy Fellow for CT Voices for Children argued the spending cap does not allow the state to ratchet up spending in years following recession and argued the volatility cap doesn’t allow extra revenue to be used to fill budget deficits, although the legislature can vote to use the Rainy Day Fund in years where there isn’t a recession. 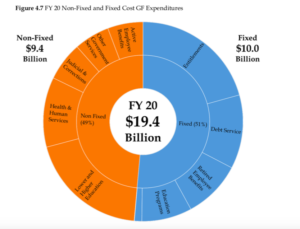 Part of the problem – acknowledged by the speakers – is the projected growth in Connecticut’s fixed costs which now take up 53 percent of the state budget and threatens to crowd out spending for other state services. Fixed costs are comprised of pension payments for state employees and teachers, retiree healthcare, bonded debt and Medicaid spending. “Placing limits on spending ties the hands of future legislators,” Senior Fellow for the Center on Budget and Policy Priorities Liz McNichol said. But the claim off handcuffing future governors and legislatures comes from both sides of the political aisle. The 2017 SEBAC agreement between Malloy and state employee unions locked in state employee benefits until 2027, preventing the legislature from making any reforms to curb the accelerated growth of one of the fixed costs crowding out state spending. The agreement also granted pay raises and offered layoff protections until 2022. Growth in teacher pension costs threaten significant growth between now and 2032, with some projections ranging as high was $6 billion per year. Rep. Vincent Candelora, R-North Branford, also attended the forum and said the caps turn legislative eyes to the growth of fixed costs, particularly the underfunded pensions, and those costs may ultimately affect municipal education funding in Connecticut. Suzanne Bates, Senior Fellow with the Yankee Institute who served on the state’s Spending Cap Commission, says weakening the spending cap would be an affront to Connecticut voters. Departing OPM Secretary Benjamin Barnes singled out acute care hospitals and municipalities for standing in the way of budget reform. Barnes said municipalities should not expect more funding and that municipal aid should be reformulated to give more to needy towns and cities, while more stable municipalities make do with less.